It can be hard to figure out whether an OP is an ELL or not. This would be helpful information, because this would give us a clue as to what the OP is really after. I've seen people assume the wrong thing, both in EL&U and the ELL forum. I did it once myself. It's important to know if the OP is an ELL, to gauge how deep the question really goes, and also, to know whether the answer needs to be written in simple English (short, straightforward sentences; few idioms; no esoteric discussions; etc.). Also, given that some people will still not find their way over there, I'd like to ask for a required field so people can choose ELL or not ELL/native speaker. This dropdown should be required on ELL as well. Some non-ELLs post on ELL, and it is sometimes embarrassing. Move "If your question is about learning English, ask it on ELL instead" up higher in the sidebar, make it stand out more, by making it bold, and don't start out using the abbreviation ELL. Right now, the help text in the input box says, "What's your English language and usage question? Be specific." This would be a great place to put something specific that would steer the ELLs to the correct place. Offer a tag called "learner". Then if someone actually chooses the "learner" tag, it would be great if there could be a way to offer the poster an opportunity to jump over to ELL. I want to make sure it's clear why I am suggesting some changes be made. It's because I see a large number of ELLs posting at EL&U, and I think they'd be better served over at ELL. I've taught English as a Second Language, both in the US and abroad, and I've lived in several other countries and been a language learner, so I have a lot of empathy for ELLs. Oh, and I've also been a translator/interpreter in the US. I hope this makes my motivation clear! 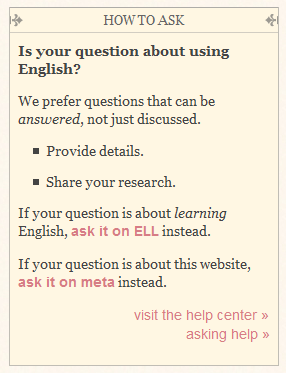 There is already a reference to the ELL site in the "How to ask" sidebar box when asking a question. Perhaps that could be better worded ("If your question springs from learning English", or something? ), but bear in mind that many non-native speakers actually use better English than many native speakers. We have a number of non-native posters in ELU with high rep scores. We wouldn't want to tell them to go elsewhere to ask their question. Can “Self-Learner” badge be called “Autodidact” instead? How about a poetry analysis site? Could ELU place an announcement for beginners linking to ELL?